Raise your glass and celebrate with a unique favor that is perfect for baby showers, weddings, and other special events. With the great variety of personalization options that are available, you can design a truly memorable gift! 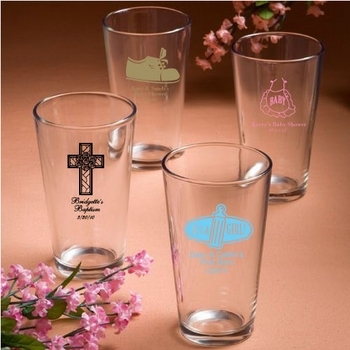 Let your creative juices flow and personalize these glasses in one of our many assortments of themes, colors, and designs to flatter the theme of your party. Each 16 ounce glass is made in the USA and measures 6 inches tall by 3 1/2 inches in diameter. Minimum order is 25. Shipping is free. They arrive ready for you to fill with your favorite beverage, sweet treats, or any surprises you can imagine.